This past weekend we made Sean’s Sushi and as an accoutrement made this Pickled Ginger to go right along side it. This is the best meal to have with friends because it’s interactive – unless you’re John & I – we just let Sean do all the work and waited for him to feed us 😉 …….good times…..goodtimes! Sorry about all the crappy photos – I was lazy and used a flash – I know, I know – sacrilegious! whaddayagonna do? Be sure to start out with 1/2 pound of fresh ginger – the skin looks almost wet or translucent – don’t get the pruney dried up leftovers in the bin. Give it a good rinse and peel off the outer skin with a paring knife or vegetable peeler. Then just keep on peeling some long pieces – a peeler works great, because you want the slices as thin as possible too. Once I got down to the fibrous area i just turned the ginger over and started on the other side. You do end up with a type of core – I just mince and freeze for another time and recipe. Put the peeled ginger in a non re-active bowl. Bring to a simmer and stir until sugar has dissolved. Pour the hot mixture over peeled ginger, let cool. Cover or place in Ziploc and let sit in fridge for 3-5 days before using. The sooner you use it the hotter it is – we used it after 3 days and it was DELISH! The longer you let it sit the mellower and the more pinkish it will turn if you didn’t use food coloring. The ginger will last about a month in the fridge. Thanks for the ginger tips. You photos are impressive, as always. what a great handy recipe, thanks! Divina – you are so sweet! are you and Mary Moh sisters in sweetness!? I can’t get young ginger either – I used the regular large ‘old’ stuff from the grocery. The trick was to use the outer part and leave a core behind. How cool! I never thought to pickle my own ginger. I love pickled ginger with my sushi and how neat to be able to make it at home! Thanks for a great recipe! Thanks for this! I agree with the ladies above – have always loved it with my sushi but never thought about how to make it. Your simple and awesome recipe makes me think “duh” THAT’s how you pickle the ginger. This is so easy? all along we thought it had more to it? Does it sometimes have mirin also? Really great post! best from Jefferson’s Table. 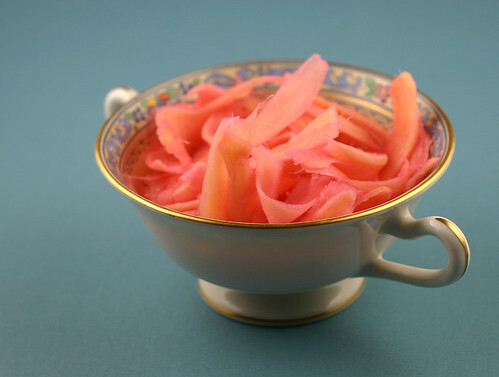 I can’t believe making pickled ginger is so simple! I will definitely make this for my next sushi night. I was surprised too. AND the bonus is that it tastes so fresh and delicious!